It is always a difficult issue for management when an employee states their desire to leave the company. The reasons can vary from the employee wishing to find other opportunities for his or her career, or personal issues that compel the employee to take time off from work. However, before the employee may leave the company, it would be helpful for employers to learn more about why the employee is leaving and how the employee felt during his or her stay with the organization. 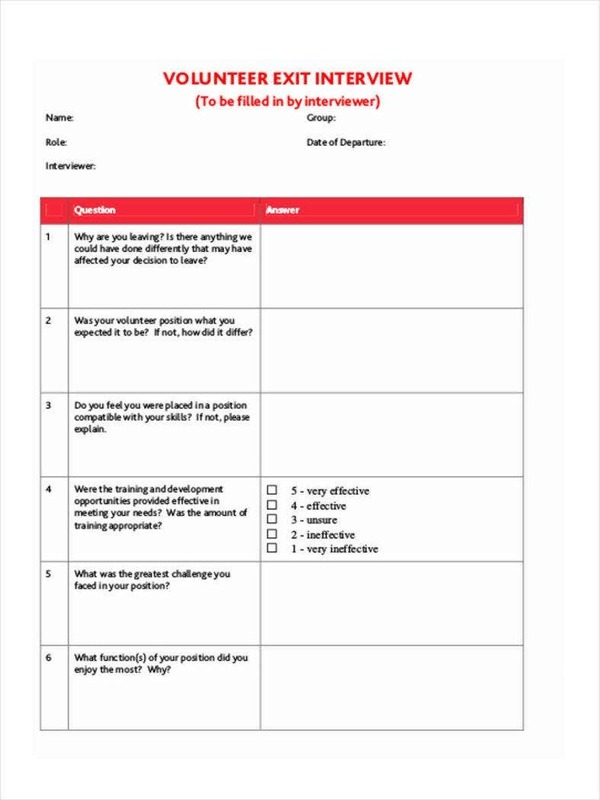 This information can be collected through exit interviews, and this article will help you conduct one that will give you all of the information that you will need. 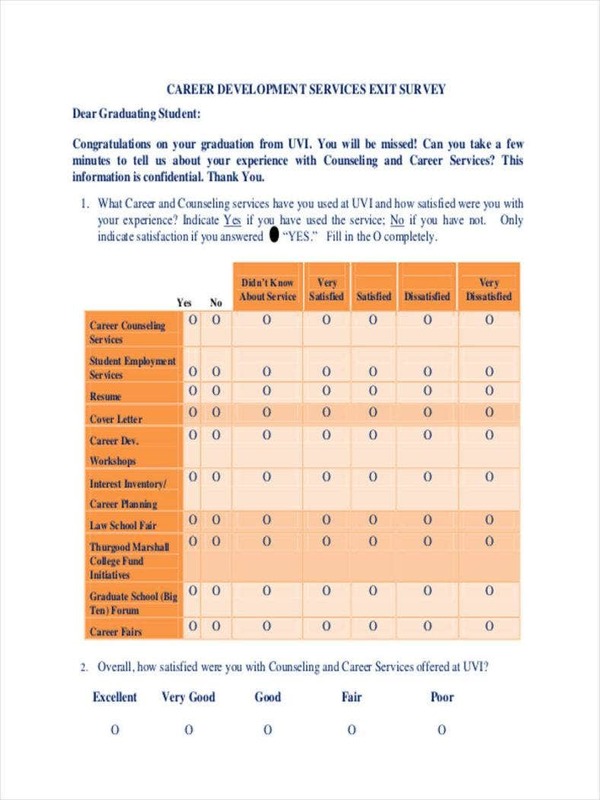 We have also collected various samples of different exit interviews to give you a better view of how other fields handle this type of discussion. Do you ever wish you knew what you could have done to keep an employee from leaving your business? 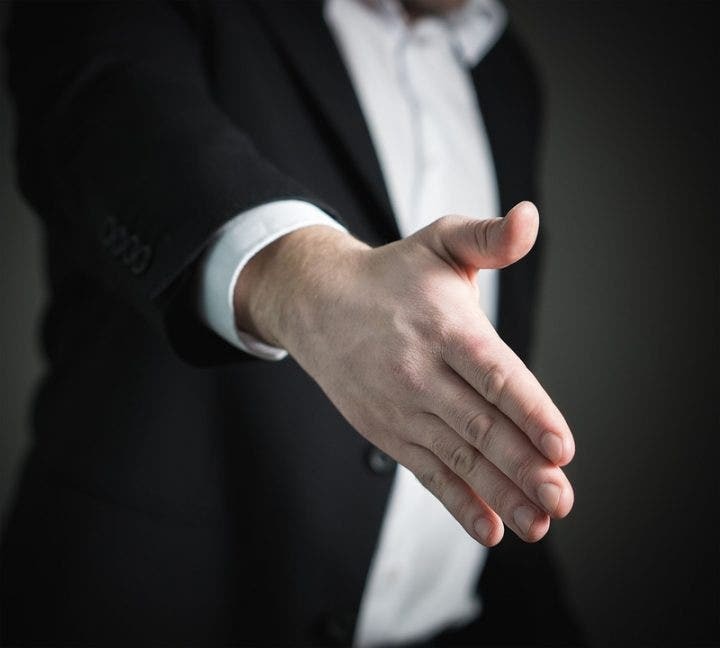 With the help of an effective interview, you will be able to learn why the employee left you as well as what you could do to ensure that future employees do not leave your business for the same reason. For the employee, it is the last chance to talk about the company. It should be an opportunity for the employee to review all of the experiences gained during his stay with the company, as well as affirm the contributions that he has made throughout his tenure. When two parties focus on sharing information that they can both benefit from, then an exit interview can definitely end the employee-employer relationship on a good note. There are many times when employee feedback regarding how the business is managed is positive and, in the event that it is not, an exit interview gives you some insight on how can fix certain problems for your existing and future employees. It is well worth it to meet face-to-face for the exit interview. Your employee is definitely going to appreciate the nice gesture and this would generally result in a productive conversation. 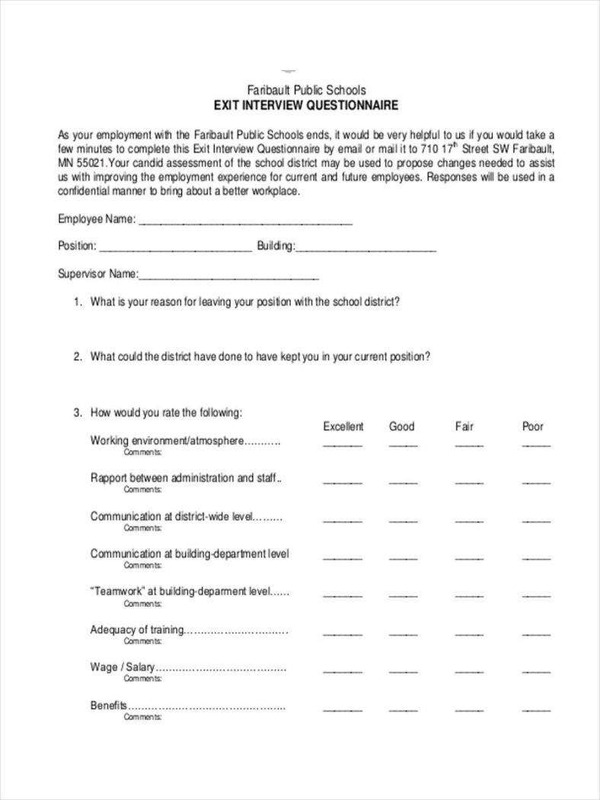 Another option is to have the departing employee sign up for an exit survey form. 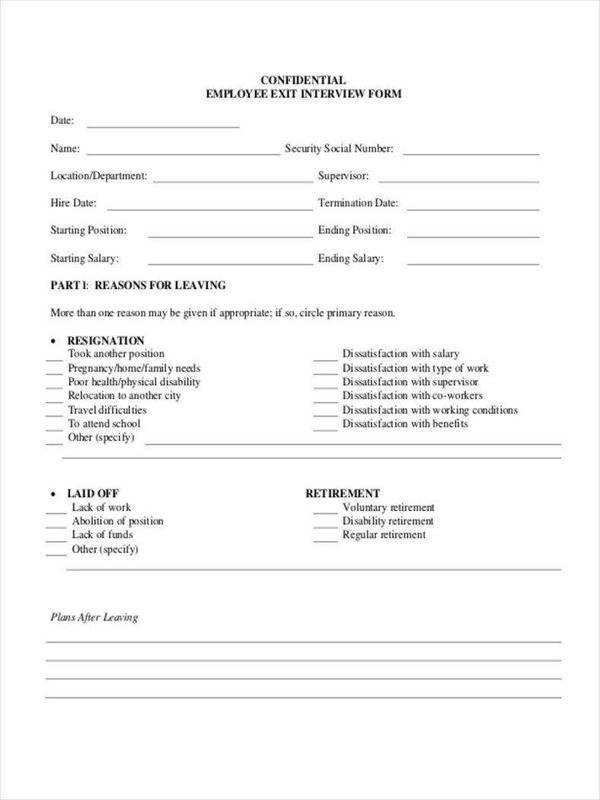 And once the employee has finished filling up the form, then you can proceed with the in-person meeting. It is best that you schedule the interview at the very end of the employee’s time with the company. This should be at least two days before the employee departs. Next, you should plan out what you are going to say to the employee and prepare all of the necessary questions. You do not want the conversation to sound scripted, but you also do not want to forget any key questions that can give you vital information regarding the reasons why the employee is leaving. You should make sure that you ask some of the same questions across the board in every exit interview. This way, you will be able to compare all of the answers and then you can pick out all of the common responses. You should open up the exit interview by telling the employee that he or she does not have to answer all or even any of the questions that you are going to ask. Also, you have to remember that you have to ask the employee if it is all right to share the answers with project management. In the event that the employee does not want you to share any of the information when you get important feedback from the interview, then you have to paraphrase the remark and ask the employee again if you could just share that particular part of the conversation. Why did you decide to leave the company? What is the company doing right? What is it doing wrong or poorly? What do you think we can do to improve the conditions? What do you think you would have done in order to improve the situation that is causing you to leave? How do the other employees feel about the situation? How do you think they feel about the company in general? What is the company not doing, that if it did, would have improved things here in the company? Please describe your general feel for the time that you have spent working for the company. If it is possible, can you please give a reason as to why you have decided to leave? What were the things that you enjoyed most while you were working for the company? If there were things in the company that you could have changed, can you list down at least three examples? Are there any ideas that you wish could have been implemented during your stay in the company? Can you please describe at least three things that you enjoyed working with your supervisor? What would you change about our employee orientation schedule program? Were there things that you wish you would have known before or during the beginning of your employment here in the company? Are there any people in the company that has given the most positive impact on your career? If there are, then may you please state the name of these people? Do you have any advice for the next person that will be taking up your position? While you have to be on the alert for any harassment or discrimination complaints or bad management that the departing employee is going to point out, you have to make sure that things do not get any worse. However, if the employee does mention any hostility or harassment that has been going on in the office during the exit interview, then you have to follow the standard procedure and address it as you would any other complaint. An exit interview should focus on the company. So any information that you can gather is definitely going to be useful. It is going to be very helpful in making sure that the company can move forward and improve on anything that needs to change or be better. This conversation also gives departing employees the opportunity to talk about their opinions and share what eventually led them to the decision to leave your company. However, you have to be very careful with what you are going to ask as it may leave a bad impression on a former employee. You should not ask any questions about specific people or issues within the office. While it is okay for you to ask for general feedback about a supervisor, you should never insert any of your opinions into the conversation. You should never feed on any office gossip. This kind of information is never going to be constructive and that means it is not going to be reliable. You cannot rely on anything that you cannot consider as fact so it is best that you do not rely on any office gossip. You should not ask any questions that can be conceived of as slander. Any questions that you are going to ask should focus only on the employee’s experience with the company. Even if you think the employee has one or two things to say about certain people or issues within the company, it is best that you do not say anything as this may be used against you. Do not let out any information that looks like you are setting up someone’s termination. Any employee’s information regarding status and performance within the company should not be shared with just anyone. You definitely should not share this with the employee who is departing as this could possibly lead to more talk within the workplace and it will only result in a negative image for you. Do not create any questions that will bring out personal issues. Just make sure that you keep the conversation as professional and work-related as possible. Do not do anything to make the employee change his or her mind to stay with your company. If you really wanted the employee to stay to begin with, then this is the kind of conversation you should have had the moment when the employee sent you his or her resignation letter. Just about every interview should be able to help you identify all of the different opportunities for improvement within the company. 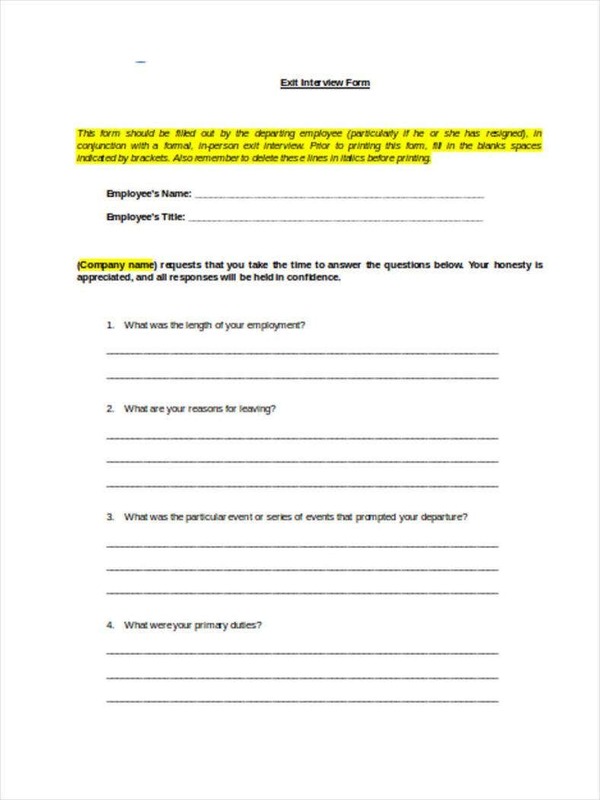 Share any information that you have gathered from the exit interview with the departing employee’s supervisor or the next best person while the feedback you have obtained is still relevant. Look for any patterns in the feedback from the outgoing employees so that you can identify all of the problems within your company. It is really going to be helpful if you decide to put the information within a sample spreadsheet so that you will be able to quickly scan everything and find any similar comments that can help your company out. In the event that you do notice a kind of trend, take it to the leadership team and consider any actions that should be taken in order to prevent any other employees from leaving the company. You have to remember that an exit interview is not something that should be used to reverse an employee’s decision to leave. Rather, it should be something that will help you understand why both good or bad employees are resigning. Focus on the good employees that are resigning. If it is an employee who has caused a lot of problems for your company, then there is no problem. But if it is an employee who was a big asset list to your business, then you should definitely ask questions as to why he or she is leaving. 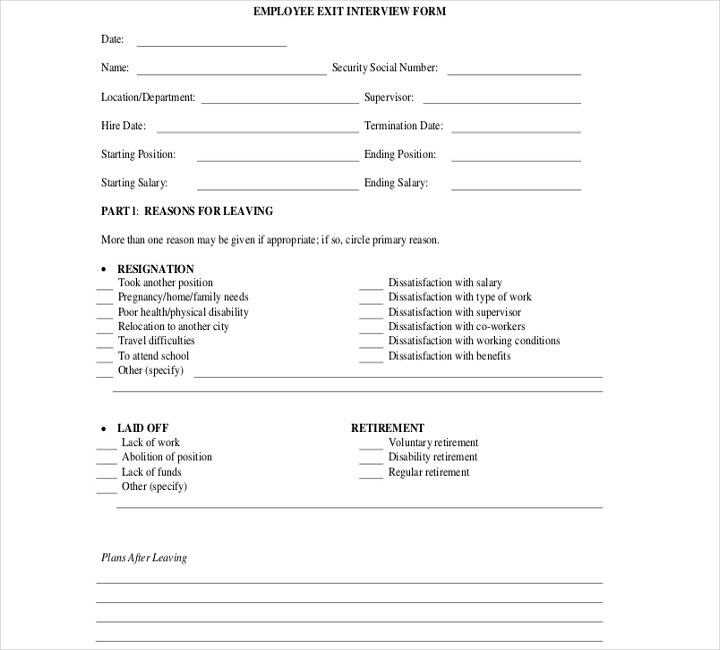 Have the interview be conducted by anyone who is not the departing employee’s direct supervisor. It is best that you have a person from Human Resource plan to do the interview. The relationship that the supervisor has with the employee might have influenced the employee’s decision to leave, so it is best to avoid setting up an interview between them. 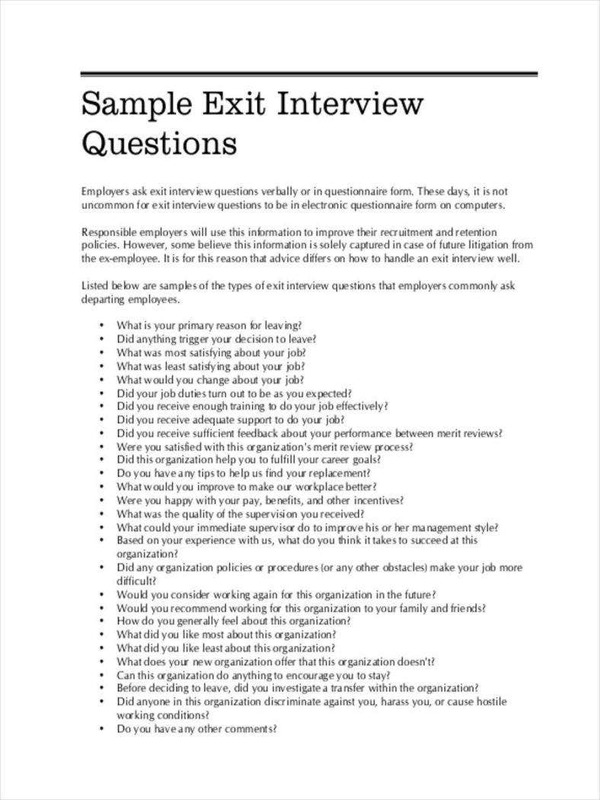 Make sure to clearly explain the purpose of the exit interview to the departing employee. The point of this interview is to determine whether there are problems that should be addressed so that you can prevent losing any more valuable employees. Explain the confidentiality of the process to the employee. You have to assure the departing employee that all of the information that is going to be shared during the interview will not be spread anywhere in or out of the office. This will ensure that the employee can safely say everything that he or she wishes to say during the interview. Make sure they keep the process as simple as possible. This kind of interview should be as brief as possible and it should only focus on specific topics. Conduct the interview in a private area and ensure that it is one-on-one. Making the employee sit through an interview with a lot of interviewers or doing it in a location where a lot of people can hear could make the employee feel very uncomfortable. This is going to heavily affect the leaving employee’s willingness to respond honestly. Encourage the employee to summarize his or her experience with the company before asking the employee any specific exit interview questions. This can usually lead to you getting answers to questions that you have yet to or are probably going to ask, so cross those off and focus on any other question that you can benefit from. Assure the departing employee that everything discussed in the exit interview will remain anonymous and no permanent records are going to be kept. 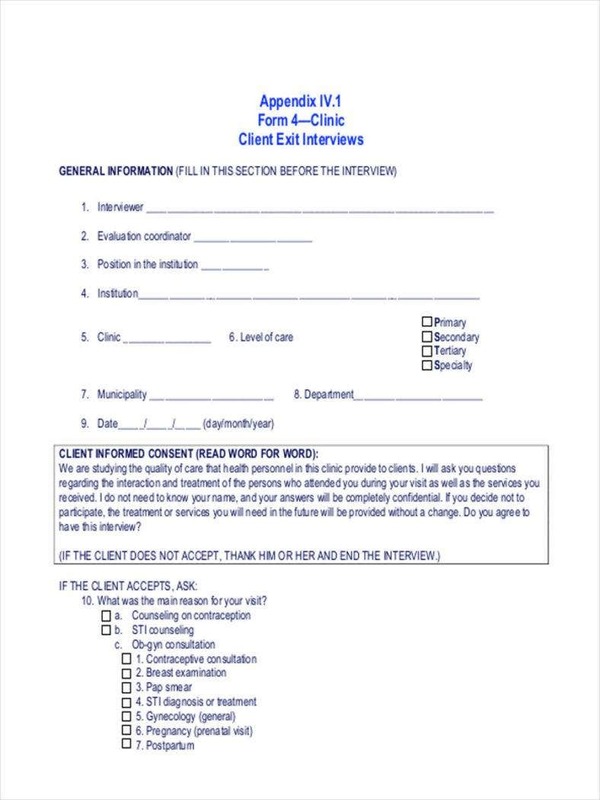 Once all of the information gathered has been assessed and conclusions are drawn, then all of the interview notes or documents must be discarded appropriately. 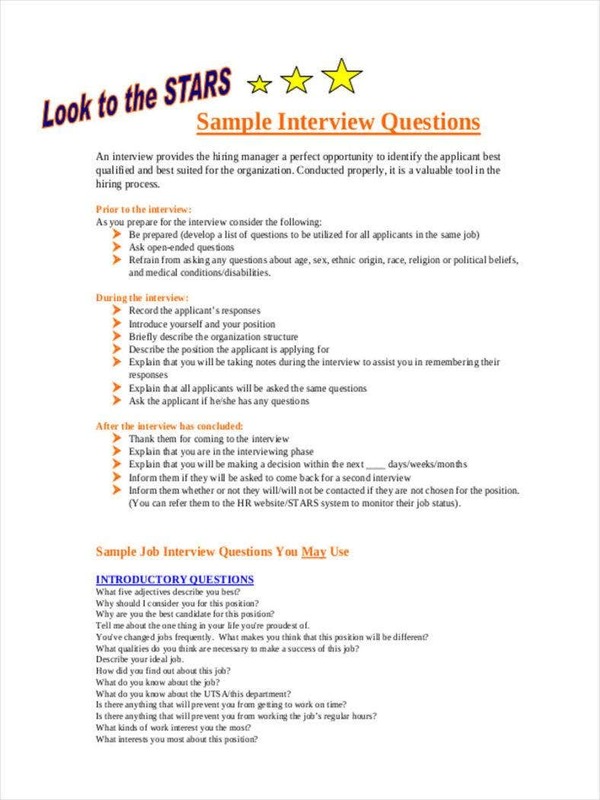 In the event that you would like to learn more about exit interview questions, be sure to read the other articles on our website.